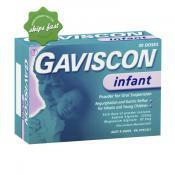 To prevent acid reflux and regurgitation in infants give them Gaviscon Infant Powder. 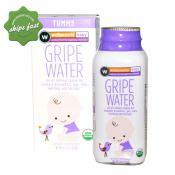 Wellements Gripe Water is an all natural stomach upset remedy that may help to provide relief for babies suffering from colic, gas, stomach upsets, hiccups and teething. It may assist in providing relief for up to 4 hours. Colic is severe pain in the abdomen caused by wind or obstruction in the intestines and suffered especially by babies. This condition in babies is a bit of a mystery and it happens to healthy, well-fed infants who cry excessively and inconsolably. The immature digestive system in newborns which still has difficulty processing food properly. Baby's tummy still lacks probiotics, which develop over time. Mum's eat certain foods that contain allergens or cause gas. 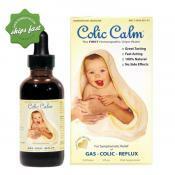 This is usually passed on to breastfed babies and results in colic discomfort and upset stomach. Bottle fed babies normally swallow air while feeding or during strenuous crying that adds gas and bloating. Infants that are overwhelmed with unfamiliar sights and sounds. The more exposure to activities the more chances of being fussy and becoming colicky during the night. How can you tell if your infant is colicky? Frequent bouts of intense and inconsolable crying. Although every newborn cries a lot, excessive crying can be defined as if he or she cries more than 3 hours non-stop for more than 3 days a week. It usually starts at 2 weeks to 4 weeks of age and will extend up to 4 months. Pulling their legs up to their tummy and arches the back when crying. Crying bouts that happens in the late afternoon or evening. How do you prevent and deal with colic? Try feeding your baby whenever you feel that he is hungry rather than sticking to a strict schedule. This is called feeding on demand. Be observant of your baby's body signals and try to establish patterns to recognize their pre crying episodes. By doing this you may be able to solve the problem before it sets in. But there may be instances when your baby may just burst into crying and you find yourself caught unaware. When this happens, calmly hold them or give them skin-to skin contact before feeding. This will help to reassure and soothe your baby. Make sure to burp your baby after every feeding time. Check out some tips on proper ways of burping. Massage your baby's tummy gently using a clockwise motion to help ease trapped wind or poo. Sucking is a sure soothing relief for any crying baby. Page updated 06/04/18 12:47:36 p.m.